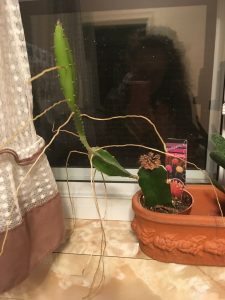 My cactus has these root-like growths coming out of the stem, making it look like a gigantic stick insect. The green part has been shrinking while the growths have been growing. Is there anything I can do to save the plant? Hello and thank you for writing us. These root-like growths are aerial roots. They help the cactus reach sunlight and absorb necessary moisture and nutrients from soil, the air and other plants, if nearby. They are not a problem for the health of the plant, but can be cut off if you prefer. Low light can cause the plant to send out aerial roots in an attempt to absorb more sunlight. If this is the case, moving the plant into brighter sunlight may diminish the growth of aerial roots. Similarly, the plant may develop aerial roots because it is reaching out to find more water or nutrients. This may be the case in your situation as you say that the green part has been shrinking. Water the plant deeply whenever the top 1 to 2 inches of potting soil feels dry to the touch. Water sparingly during fall and winter, providing just enough moisture to keep the plant from wilting. Feed the plant once every month, beginning in late winter or early spring, using a regular houseplant fertilizer. Stop fertilizing when the plant is preparing to bloom. ← Too much Water in a water table?